Have you ever gone out walking in the woods and come across a really cool looking piece of wood? Or, you may have come across some cut logs that ants have eaten the inside out of. When they do this, it makes a neat design in the log when you cut it into slices. You will get either a donut shaped slice or something much more intricate. Decorating with natural elements like this is like displaying a work of art. 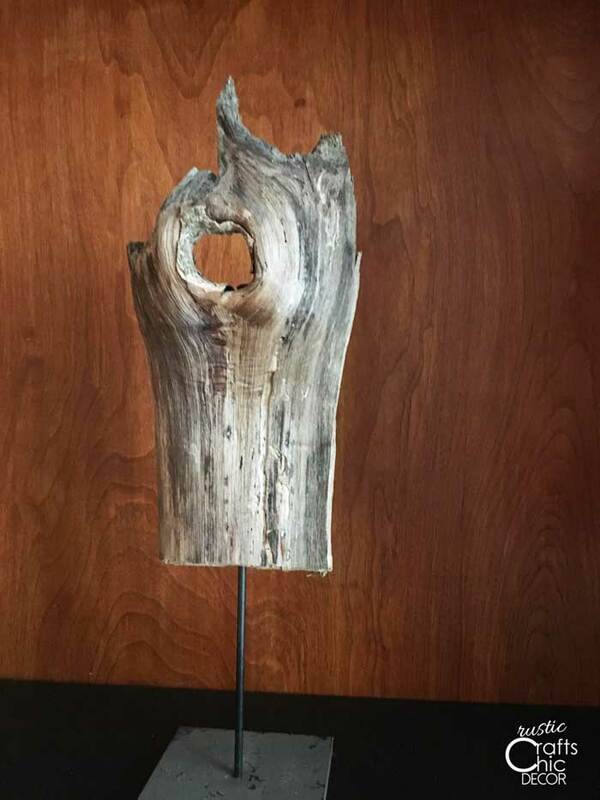 So…how do you find a tree with a hole in the center? You can check the bark of a tree for fine sawdust shavings. If a tree is sick, insects will bore into it leaving visible shavings on the bark that are clear to see because of the lighter color. There is a good chance that if you cut this tree down it may have a hollow or partial hollow center from ants. Of course, if a tree has already fallen it is real easy to check the inside. Try a few cuts with your chain saw up the length of the tree. Other pieces of weathered logs are just found by having a good eye and imagination for the decorative possibilities. Take walks in the woods with a new focus and you might be surprised at what you find. We have found both types and thought they would be great to display in our home. They are naturally created pieces of art! 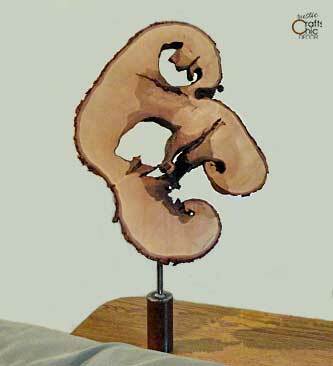 For the “ant art” my husband cut slices of the tree with his chain saw, cleaned them up and then made a stand for them by welding a steel rod onto a metal base. We also put a coat of satin polyurethane on all of the pieces to seal and protect them before bringing them inside to display. This is one of my favorites because of all of the curves but even just the round pieces, like a donut, look artistic on a stand. Would you use natural art or in your home or would you prefer to purchase all of your home decor? I really like the chest above, the color and the additional style embellishments added (the legs).